The course introduces you to the big data & machine learning capabilities of Google Cloud Platform. Learn to use CloudSQL & Cloud Dataproc for migration of workload, master interactive data analysis using BigQuery & Datalab, train & use neural networks using TensorFlow and understand data processing architectures, TaskQueues & DataFlow. The course includes lab exercises on Google Cloud Platform and prepares you for Google certified professional- Data engineer certification. 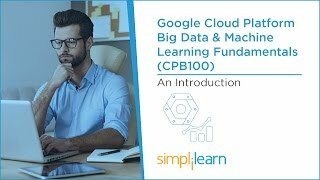 Google Cloud Platform Big Data & Machine Learning Fundamentals (CPB100) will introduce you to the Big Data & Machine Learning capabilities of Google Cloud Platform. It provides a quick overview of the Google Cloud Platform and a deeper dive of the data processing capabilities. The training sessions were interesting and effective. All our trainers are Google certified and highly qualified with over 15 years of experience in training and are working in the domain. What is LVC? Is it a classroom training? LVC or Live Virtual Classroom training for CPB100 is a live training conducted via online live streaming of a class. LVC is run by Google certified trainer with over 15 years of work experience in the domain and training. The class attended by the global audience can enrich your learning experience.